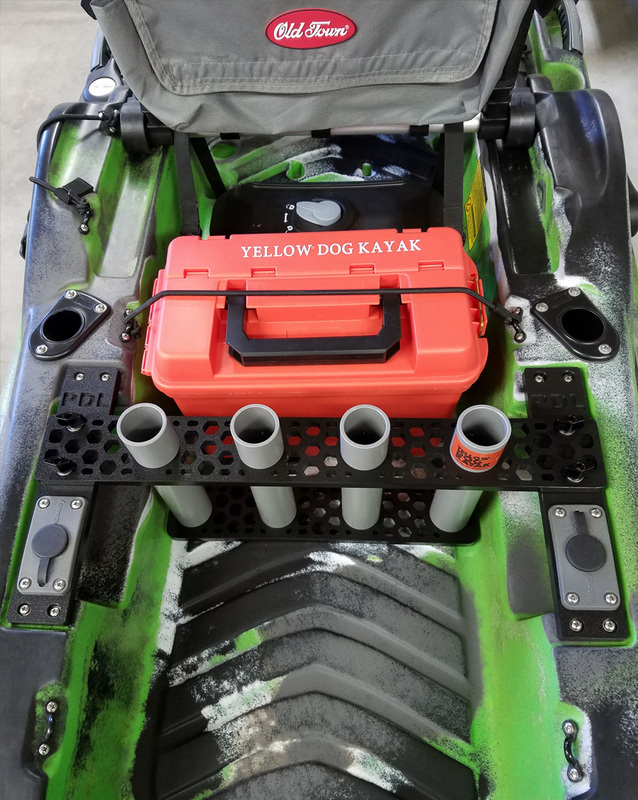 I’ve been an avid Kayak Angler for the past 10 years and wanted a way to carry multiple rigged rods, camera & flag on my Predator and didn’t want to lug along a heavy crate. I’m currently a Johnson Outdoors Adventure Team Pro Staff Member. 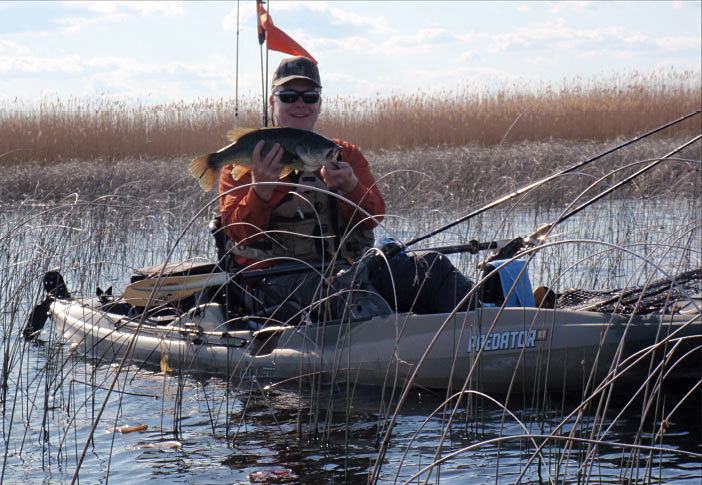 I’m also a member of Michigan Kayak Fishing “MKF” the fishing team that has won Worldwide Freshwater Multi-species Championship Title in 2012 & 2013. 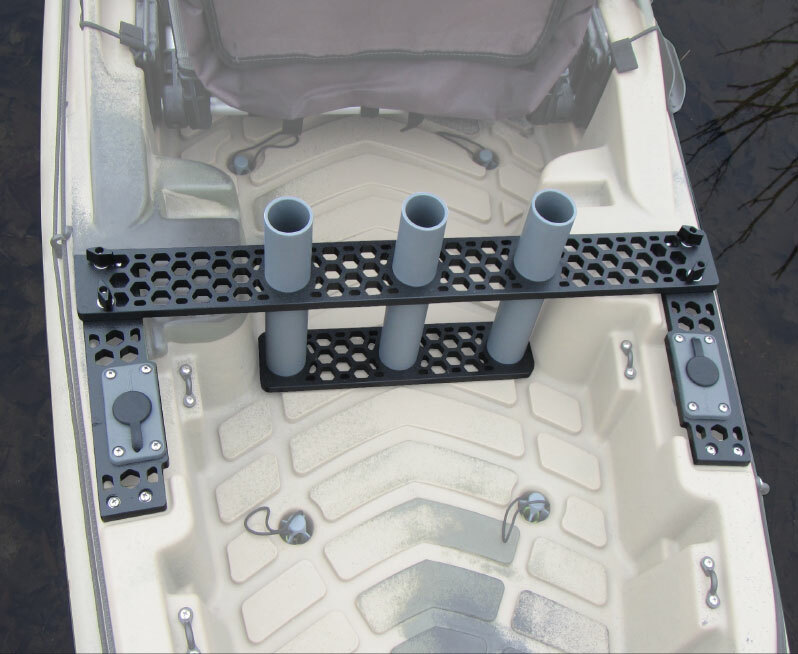 Predator PDL rod holder system includes the 4 tube cross section, along with two side plates with integrated scotty #244 flush mounts for additional rods holders or accessories, like lighted flag and camera pole. 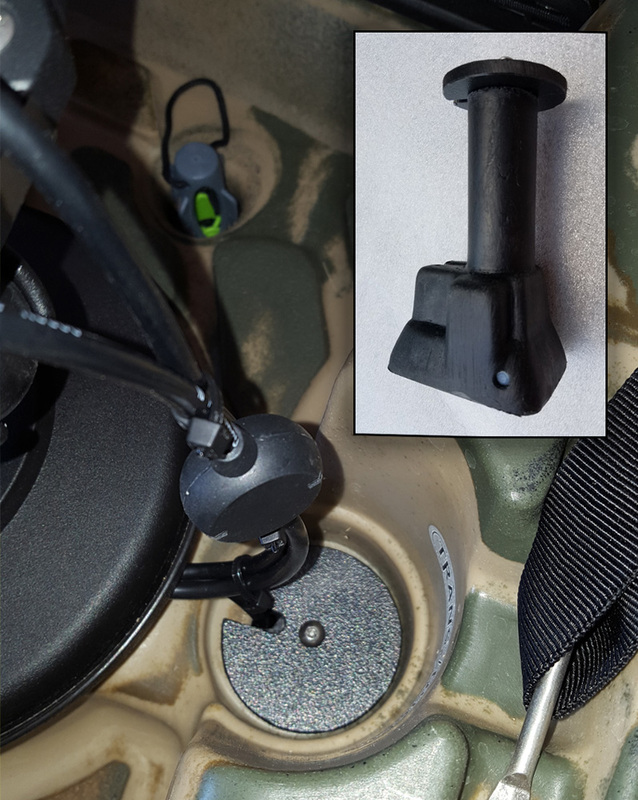 Humminbird Transducer Mount for the Predator PDL. 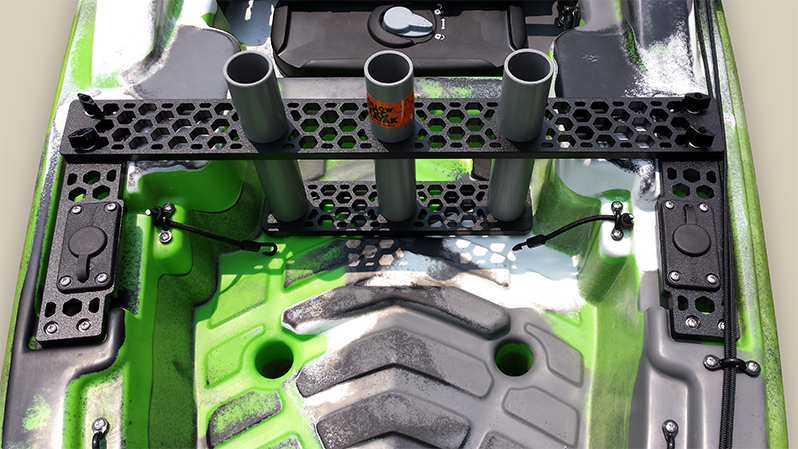 This unit installs in seconds and holds your transducer securely in place just above bottom of kayak. The bottom-right inset shows the top-view of the transducer mounted from the kayak's cockpit area. 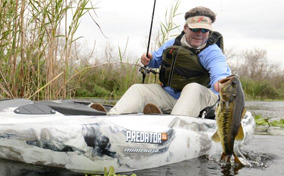 Predator 13 Rod Holder System is essential for the anglers wanting to securely carry up to 5 rods. Factory rear mounted rod holders tend to lean the rods back and to the side. This keeps the rod tips in the same area as your back cast. I have also had a rod tip get caught on a tree limb and flip the rod out of the pocket since it was already leaning back. This unit keeps all your rods straight up tucked in behind your body and out of your casting radius. This unit is designed to be installed in minutes. Simply remove existing plates on the Predator, using the same hardware install the Yellow Dog plates. The cross tube section drops over 4 studs on the side brackets and use supplied thumb screws to secure. Unit is made out of H.D.P.E. plastic and the removed honey comb design keeps the units weight close to 3 pounds and does not affect the integrity of the plastic. Each plate is precision cut on a CNC mill and assembled in Michigan. Kit includes the three tube cross section along with two new side plates with integrated Scotty #244 flush mounts. Scotty mounts can hold numerous accessories from Yak Attack VisiPole, Camera Pole and Rocket Launcher Tubes. 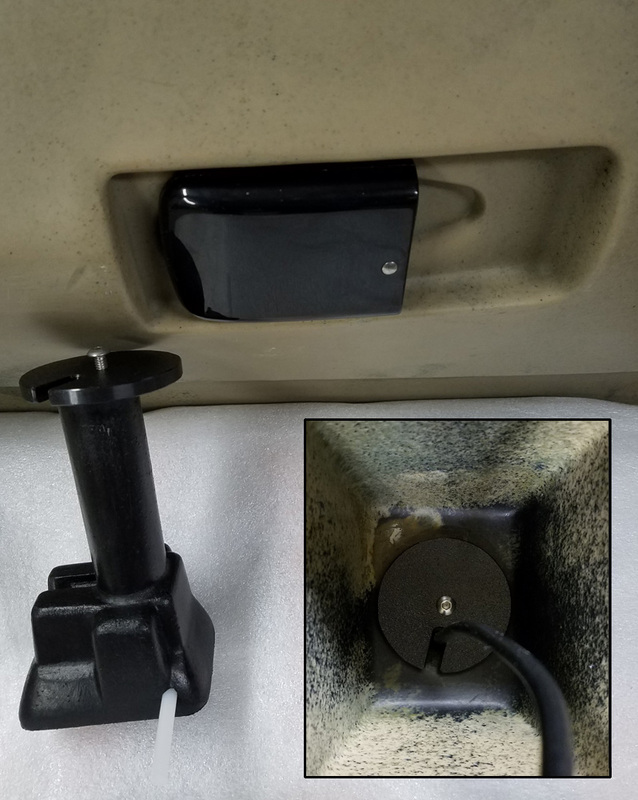 Humminbird Transducer Mount for the Predator 13. 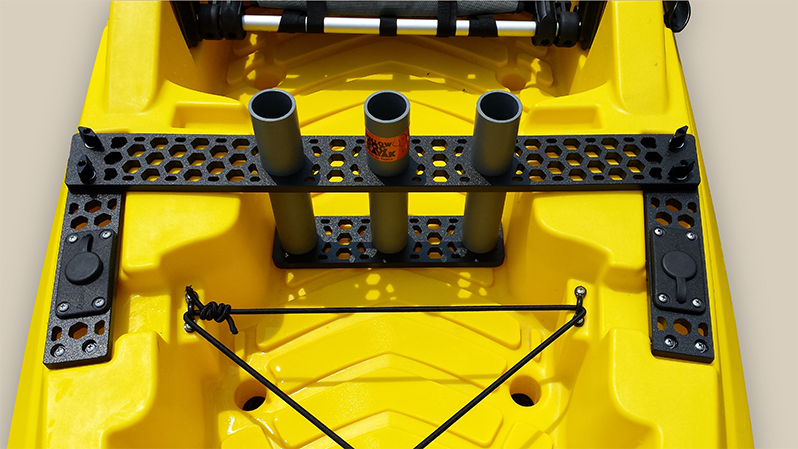 This unit installs in seconds and holds your transducer securely in place just above bottom of kayak. The inset shows the part and the main photo show a view of the transducer mounted from the kayak's cockpit area. Predator MX Rod Holder System includes the three tube cross section, along with two new side plates with integrated Scotty #244 flush mounts. Predator XL MinnKota 4 place rod holder system installs conveniently behind the battery. 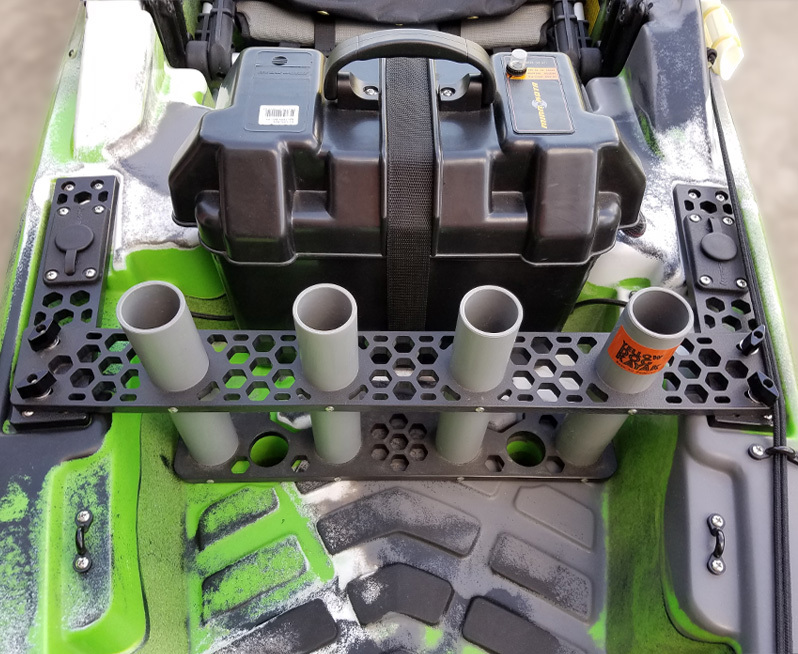 This rod mounting system includes the four tube cross section, along with two side plates with integrated Scotty #244 flush mounts for additional rods and accessoreis. Predator XL Rod Holder System includes the three tube cross section, along with two side plates with integrated Scotty #244 flush mounts. Note: Cross tube system does set across battery section on Minn Kota Models. 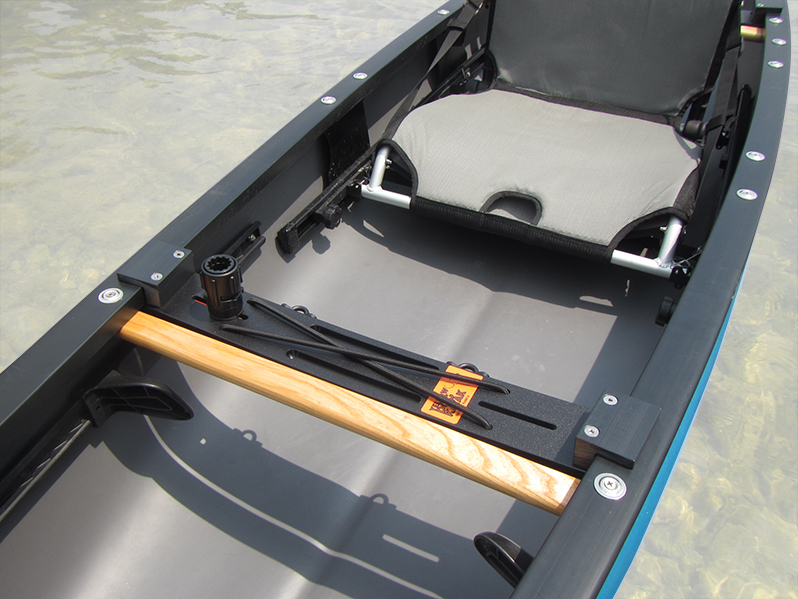 NEXT Rod Holder System gives you the ability to carry fishing rods, flag/light or camera mont. Unit includes the three tube cross section along with 2 mounting brackets. 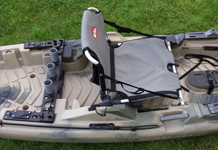 Unit installs in seconds without drilling holes in the canoe. 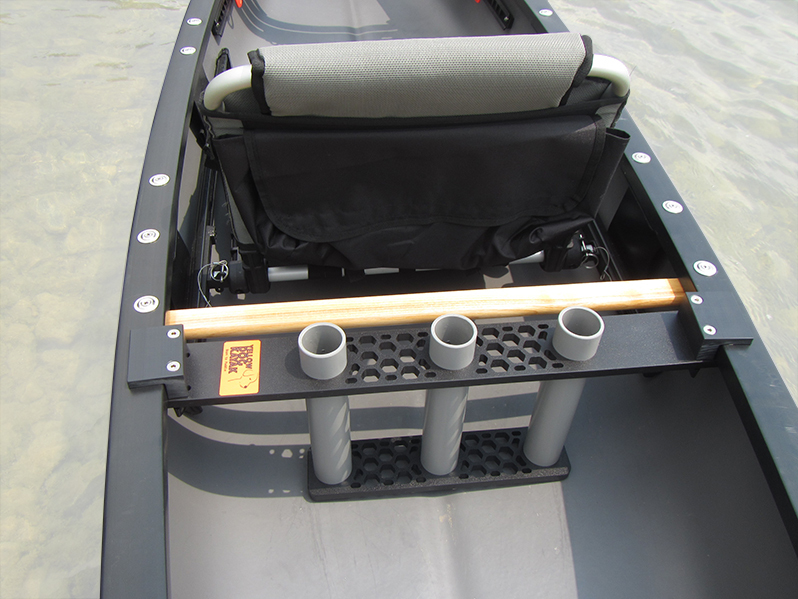 NEXT Front Thwart Gear Plates gives you the ability to keep items off the floor of your canoe. Unit includes one Scotty #438 Gear Head Track Adapter to hold anything from rods to cup holders. Also included is Bungee cross strap, 2 pad eyes and 2 mounting brackets. Unit installs in seconds without drilling holes in the canoe.